Etsy is a marketplace that allows you to sell your handmade products, unique items, and antiques. The visitors of this marketplace are mostly from the USA and the neighboring countries. So if you are planning to sell in the specific region then Etsy is one merchant that you should not miss listing your products here. And if you are already selling through your own Shopify based store, ExportFeed offers you unique opportunity of Shopify Etsy Sync. Why the discussion about Etsy Vs Shopify? Etsy allows you to create your individual product listings but it also allows you to create your own storefront. And Shopify is itself a hosted eCommerce platform with a lot of features. Etsy is a marketplace whereas Shopify is a platform. But, they both allow you to create your webshop easily and conveniently. This is the main reason why online shopping advocates are mostly found debating over the topic of Etsy Vs Shopify. The main strength of Etsy is that it is popular among a lot of loyal online customers who purchase on a regular basis. And, the Shopify based eCommerce sites mostly acquire visitors through advertisement campaigns. Another notable point about Shopify shop owners is that they are mostly engaged in the drop shipping business. Are there some common points among Shopify and Etsy? Shopify and Etsy can definitely go hand in hand. If you are a Shopify based business owner, you can benefit from the Etsy marketplace a lot. And, if you already own an Etsy storefront, it is highly recommended that you start your own Shopify store as well. Here are a few points about why you should create your own Shopify store even if you have an Etsy storefront. When you start your shop on Shopify, you enjoy the flexibility to add features from the app store. You don’t have the control over the products and categories that you can sell on Etsy but you can definitely send your handmade products from Shopify to Etsy. You increase goodwill and brand on the overall market when you own a Shopify shop. As for Etsy storefront, your goodwill and brand recognition is limited to Etsy. Shopify doesn’t charge you the transaction fee and your product listings on Shopify don’t expire as it does in four months in Etsy. It may seem that it is by far better to sell on Shopify than to sell on Etsy but selling on Etsy also has massive positive points. Your products get exposure among the loyal customers of Etsy who are already accustomed to buying from that platform. The number of active buyers in the Etsy marketplace recorded at the end of the year 2017 was around 33.4 million. Etsy takes care of the technical aspects and you don’t have to worry about integrating payment gateways, upgrading server spaces or other hassles. More than anything, Etsy has their dedicated team of marketing experts who make sure about the sales growth. They make sure that the merchants listing products generate sales revenue through Etsy. These are a few benefits of selling on Shopify and selling on Etsy. If you get into details of the benefits mentioned, you don’t want to miss any of those. So what can you do? Setup your Shopify shop. Then, while adding products, make sure that the products that you want to send to Etsy are under different collections. Don’t mix up those products which you want to sell on Shopify only and those that you want to sell both on Shopify and Etsy. Create a seller account on Etsy marketplace. 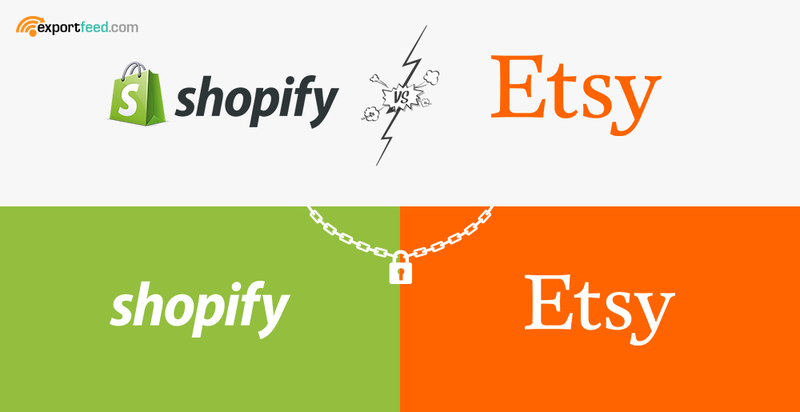 If you want to get the benefit of improving your goodwill, you should create your Etsy account name as the brand name that you use on your Shopify shop. On your Shopify shop, install some product feed management plugin. 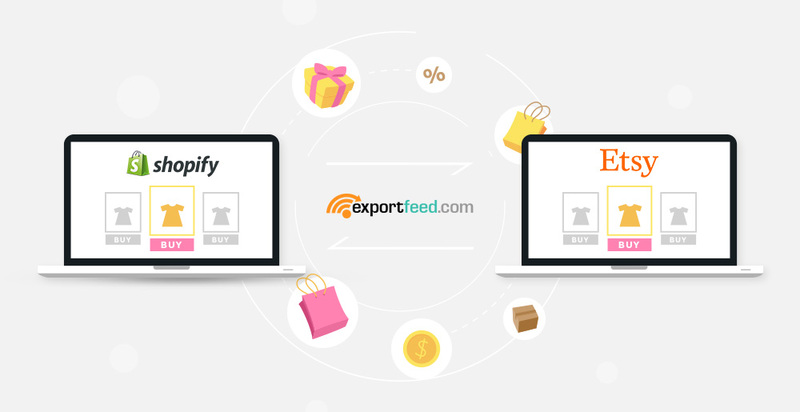 As ExportFeed gives you a free trial of 7 days along with a personalized demo for free, we recommend you to install ExportFeed on your Shopify shop. 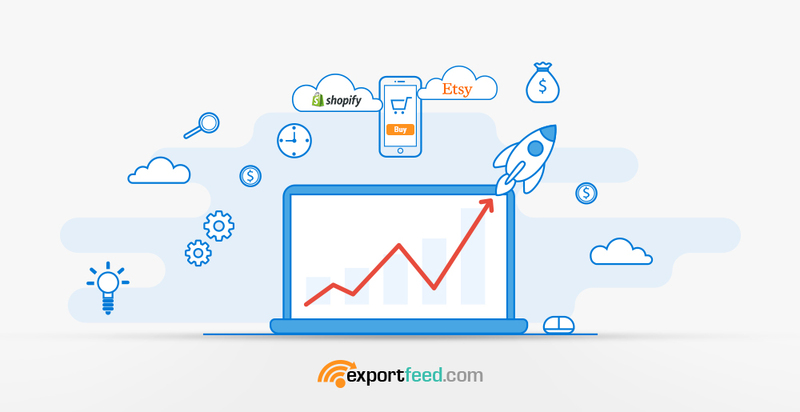 Next, connect your Etsy store with your Shopify shop through ExportFeed. Then select the products you want to upload to Etsy. After completing this process, you have started to collect the benefits of selling on Shopify and selling on Etsy. If you have more questions regarding Etsy Vs Shopify, please let us know. ExportFeed app is available in the Shopify App store so you can install and get started immediately. Product feed creation or even directly uploading products to Etsy from Shopify is a straight-forward process. You can customize your product attributes and map them with those of Etsy marketplace within a few clicks. ExportFeed validates your products before you upload them to Etsy so you reduce the chances of errors. If you’re using ExportFeed app for the first time, we offer you one-time free feed setup even for a trial plan.